Today there are news from London: the animal shelter Battersea Dogs & Cats Home has been visited by two Jack Russells. They already have a home, but in solidarity with those who do not. Beth called and Bluebell (Blue Bell), and its owner is the famous: Camilla of England. Both were adopted at the shelter last year, when they were only sleeping. 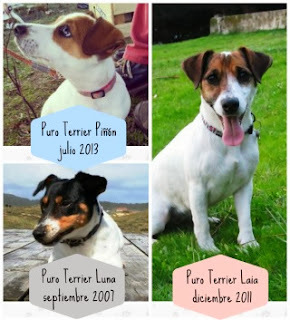 From PuroTerrier, and especially at this time we recommend taking them if you give animals. 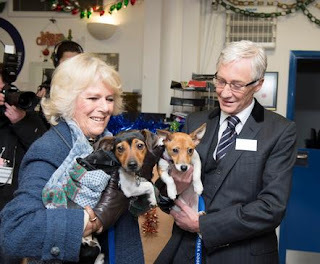 Hoy una noticia desde Londres: el refugio de animales Battersea Dogs & Cats Home ha recibido la visita de dos Jack Russells. Ellos ya tiene casa, pero se solidarizan con los que no la tienen. Se llaman Beth y BlueBell (Campana Azul), y su dueña es la famosa: Camilla de Inglaterra. Ambos fueron adoptados en dicho refugio el año pasado, cuando sólo eran unos cachorritos. Desde PuroTerrier, y sobre todo en estas fechas recomendamos la adopción en caso de querer regalar animales.